Simply adding technology to a wearable item does not make it more impactful and improve on the lives of the users. We feel that it is important to design products that solve problems, utilizing technology in order to assist in this process. 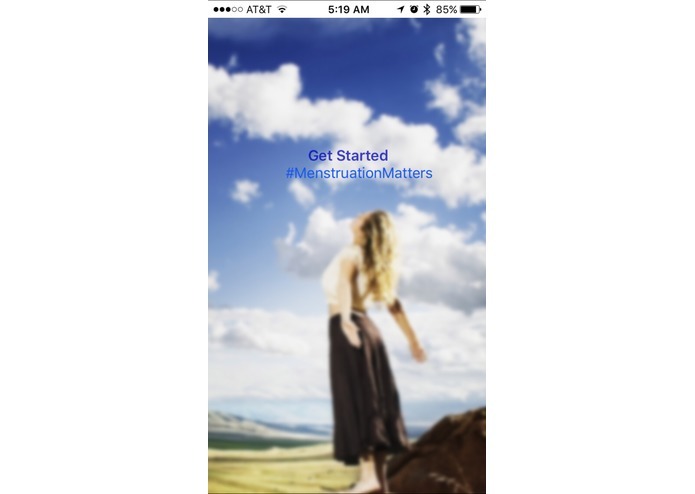 By focusing on alleviating the pain and discomfort caused by menstruation, we seek to underscore the hidden challenges of womanhood. Ideally, through clever design, we hope to accomplish this goal without making those challenges any more visible to an outside observer. Our underwear functions as a covert, convenient, and drug-free way to seek relief from menstrual cramps and/or lower back pain. This undergarment can soothe the discomfort of the wearer though its self-contained heating pad from within a removable compression panel. This will ideally allow the wearer to continue with their daily activities that would have previously been disrupted. 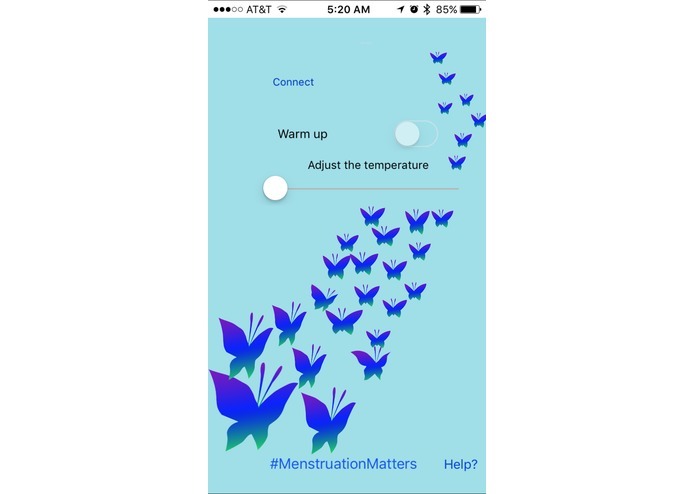 The heating element is accessible and adjustable through a free, downloadable mobile phone app. 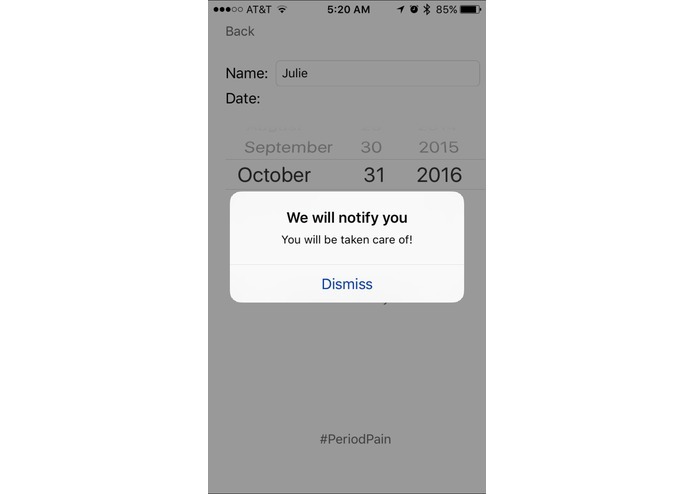 This app can also help track the menstrual cycle, giving the user a notification reminder a few days before their cycle is expected to begin. This project came together in three parts: the garment, the hardware, and the software. Using an existing pair of underwear, we created and customized a pattern to better suit the needs of our product. 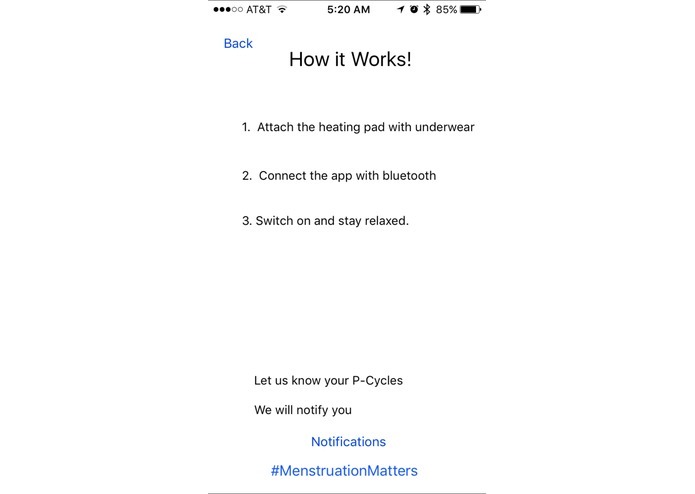 Fabrics were carefully selected in order to make a comfortable and fashionable pair of underwear, utilizing innovative solutions to add in a smartphone-controlled compression and heating panel. The heating element for this piece came from Prometheus Technologies, who designed the 2Degree Jacket, which “incorporates ultra-thin heating and power technology to allow the wearers to customize the jacket’s temperature using an app installed on their smartphones or smart watch.” Using technology from the hack rack in the fashion lab, we created a sleek device controller by connecting an Arduino Uno to a Low Energy Shield Bluetooth. The Bluetooth connects to a smartphone via an app. This app has a temperature on/off and control switch, sending data to the controller, which acts accordingly. Despite our vision to create a product that would exist inside a pair underwear, no one on our team is fully competent with a sewing machine. This lack of expertise made the task of garment making quite daunting. We wanted to make a functional-yet-fashionable product as well, which involved the use of knit fabrics and lace, adding to the difficulty of our project. Collectively, our team also had no pattern making experience We relied on innovation and some helpful tips from mentors and fashion students to assist us through the pattern-making process. 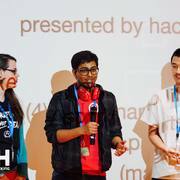 We were further challenged by the limitations of the supplies and tools we brought with us, in addition to the limited technical hardware that was provided by the Hackathon. There were a plethora of issues that came up during the software and hardware programming stages, too as we were working with a generally unfamiliar chip. Lastly, as a small group of diverse individuals, we encountered difficulties with our different styles of communication, working habits, and skill sets. There were more than a few instances where we were not on the same page as a group, and had to stop and catch up. Before we started this project, we were all strangers to each other. Our group organically formed, by happenstance, with each of us having a different area of expertise. While the responsibilities for our collaboration were divided according to our individual skill-sets, we all came away from this project with new knowledge. Rachel now almost knows how the technology in our project works. Azim learned how to use the Serger machine and by the end of the project, and easily could have sewed almost the entire project because he’s awesome. All of us learned how to collaborate and trust the skills of each other, despite being strangers as of Friday. We overcame working outside of our comfort zones. Azim learned how to bridge between Objective-C and Swift, connecting Arduino Uno with Bluetooth shield to an iPhone, and how to use Serger machine. Charlie learned that there’s almost always an easier solution to the problem at hand and about how Bluetooth Low Energy works at a lower level. Rachel learned that incorporating technology into wearable objects is not unattainable, as long as you are able to work with people who know how to do it. (She still barely know how the tech aspects of this project work.) Serger machines are not nearly as terrifying as they used to be, and she understands the basics of working with knit fabrics and creating patterns. 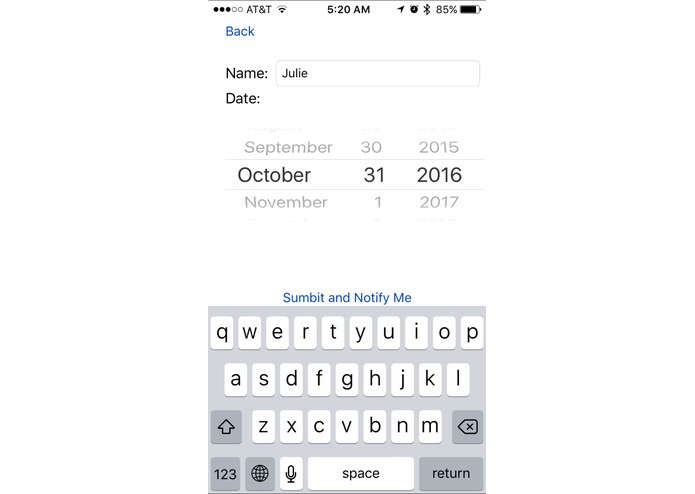 We would like to continue to develop the app database, allowing for tracking of cycle variations, which can assist healthcare providers in analysis. 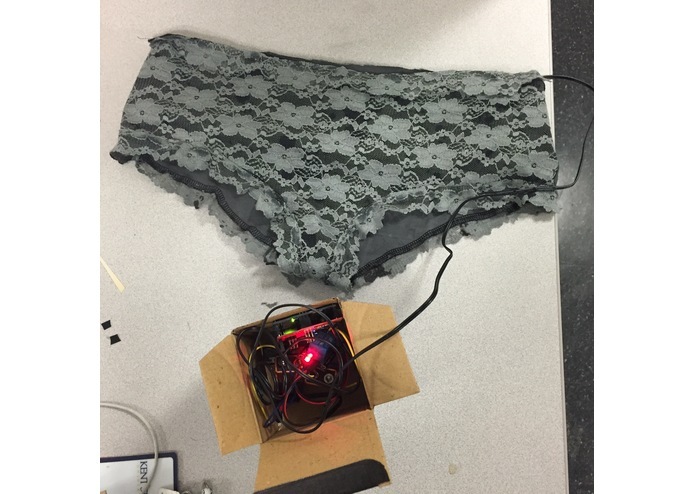 This current design of undergarments is targeted towards females, but there are many other people who can benefit from this device, such as transgender men and people who have kidney stones or other health issues. Real Users find the one combination of bizarre input values that shuts down the system for days.